Three Everton substitutes inspired the Blues to a second half victory over Fulham to move within 4 points of Arsenal in the final Champions League place. After a tepid first half the Blues came to life after the break to brush aside Fulham and record their fifth straight league win. Everton produced the clearest indication yet that they have the mentality to finish in the Premier League top four. With expectations among the supporters at fever pitch, Everton put aside a poor first half to score three second half goals and prove to the watching nation that they are ready to take the next step in the teams development. An injury to Ross Barkley proved the catalyst for Everton’s success. 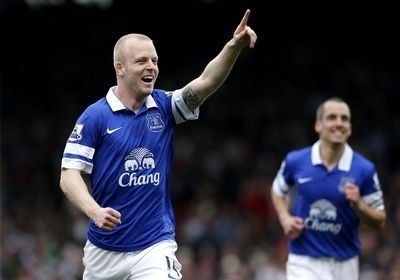 Roberto Martinez made a tactical reshuffle and brought Naismith on to partner Lukaku in attack. The change had an instant impact, the Scottish forward firing home courtesy of two deflections. Everton were well on top now and should have wrapped the game up, Lukaku in particular having two good opportunities to put the game to bed. But Everton’s failure to convert came back to haunt them, with Fulham substitute Dejagah firing a blistering shot home from the edge of the box. The game was on a knife edge now and Tim Howard had to be alert to deny bottom of the table Fulham taking the lead. Roberto Martinez has proven on many occasions his aptitude for a substitution and again his changes proved decisive. McGeedy and Mirallas who had moments earlier replaced Osman and Deulofeu combined to put Everton back into the lead. A fantastic through ball from McGeedy picked out Mirallas who controlled the ball instantaneously and guided his shot past Stockdale in the Fulham goal. With Fulham now forced to push on in search of an equaliser Everton were able to take advantage to score a third and seal an important victory. Leighton Baines latched into a loose ball in the box and squared for Naismith to poke the ball into the far corner to secure a 3-1 victory. Next up are Arsenal at Goodison in Everton’s biggest league fixture for just short of 10 years. Another Everton victory and Champions League hopes will turn to expectations.